From a quiet walk here on Delaware Seashore State Park to the bustling Rehoboth Beach Boardwalk, Delaware's Atlantic Ocean beaches feature plenty of variety for the foot traveler. Beach hiking is something I do a lot, having lived on the beach since 2011. I love being out in the open where I can see the sky, monitor the evolving weather, and stay in touch with the 'big picture' of the landscape that surrounds me. So often in wilderness hiking in the eastern US, you are encased in the 'Green Tunnel' of the woods. Beach hiking provides a counterpoint to that - For me it creates Balance, and Balance is good. 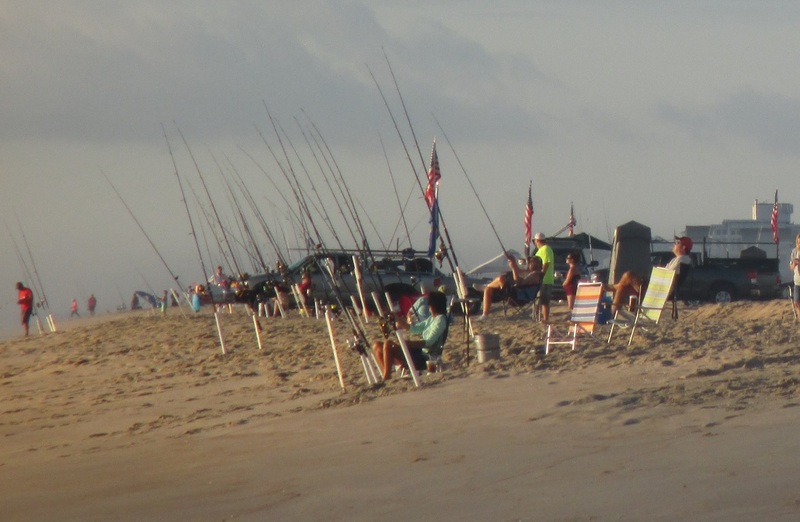 Delaware has about twenty-five miles of Atlantic Ocean beaches. I happened to be spending a couple weeks visiting with family at an oceanfront cottage in South Bethany, so I undertook to hike all of them. 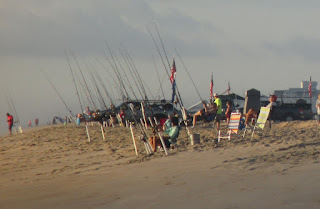 I've already reported about the beach hike in Cape Henlopen State Park. This report is about the rest of it. Let's start at Deauville Beach, just south of Cape Henlopen State Park. This is a public park in the northern pert of the popular resort town of Rehoboth Beach. Hiking south from there for about 3/4 mile brings one to the mile-long Rehoboth Beach boardwalk, shown here early on a September weekday before most of the joggers and walkers were out. The focal point of Rehoboth is where Rehoboth Avenue meets the Boardwalk. There's a big gazebo-like bandstand there and a Veteran's Memorial further back on the median. And of course there are plenty of shops and restaurants to browse. I did my usual out-and-back hike segments, so besides walking every inch of beach, I had a chance to walk the other way on bike paths, roads, and highways. 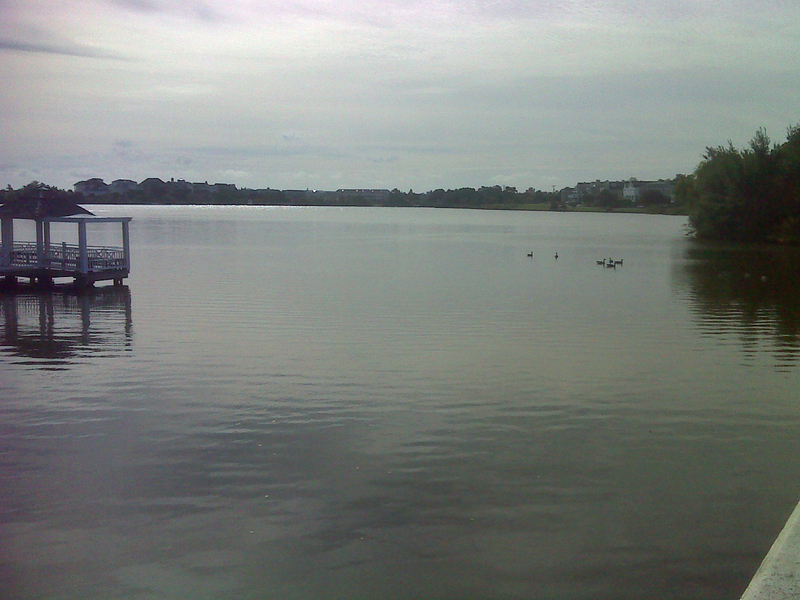 In south Rehoboth that means skirting around the west side of the wonderfully picturesque Silver Lake, which is just a strip of sand away from the ocean. Adjacent to Rehoboth, the next town south is Dewey Beach. 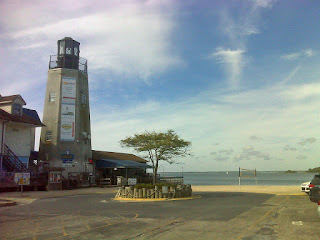 It's town-center feature is on the sound side--the faux lighthouse and restaurant and enough sandy beach for volleyball. The lighthouse is a replica of the old Cape Henlopen light. South of Dewey Beach I left civilization and started the first leg of roughly eleven miles of public beach in Delaware Seashore State Park. Tide had been high, washing away all signs of other footprints, so my trail was easy to identify--see the photo up top. This quiet five mile stretch of beach north of Indian River Inlet does have several access points. The first is the Bathhouse on Tower Rd. 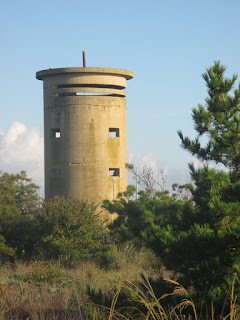 There you find two of the eleven WWII military observation towers built to protect the mouth of the Delaware Bay. The bathhouse architect took full advantage of the situation. There's only one other ocean-side structure on this five mile beach before it is interrupted in the by Indian River Inlet. That's the historic lifesaving station. 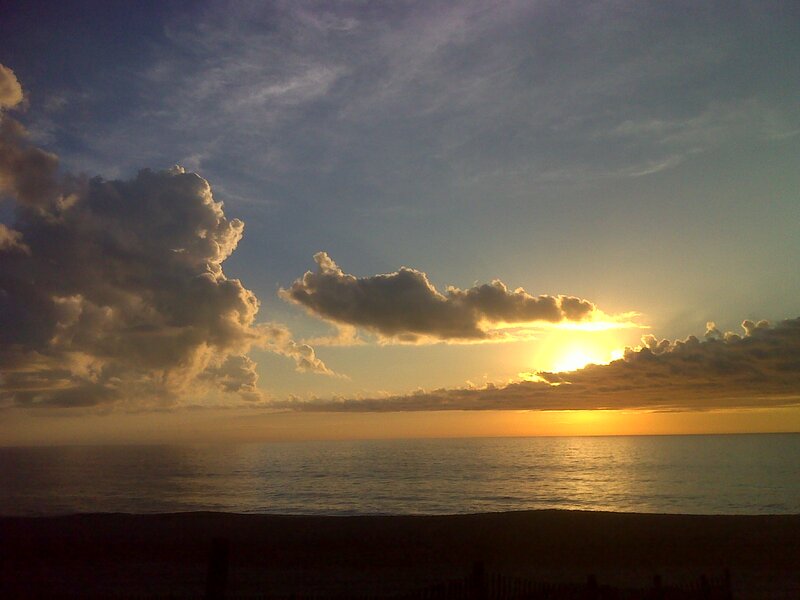 Here on the quiet beach, away from the crowds, nature took center stage. I passed gulls feasting on what looked like a prehistoric creature--its huge white back and side plates gave away its identity. It's a 200 million year old species--the Atlantic Sturgeon. This is a rare find. Because of persistent over-fishing and pollution this species has been listed under the Endangered Species Act. This time of year the birds love to congregate on the beach. Here's a crowd of common terns. I'm tempted to caption this "One good Tern deserves another". 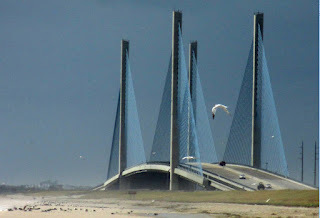 The bridge over Indian River Inlet was replaced in 2012 by a state of the art cable-stayed suspension bridge that reminds me of a fleet of sailboats. 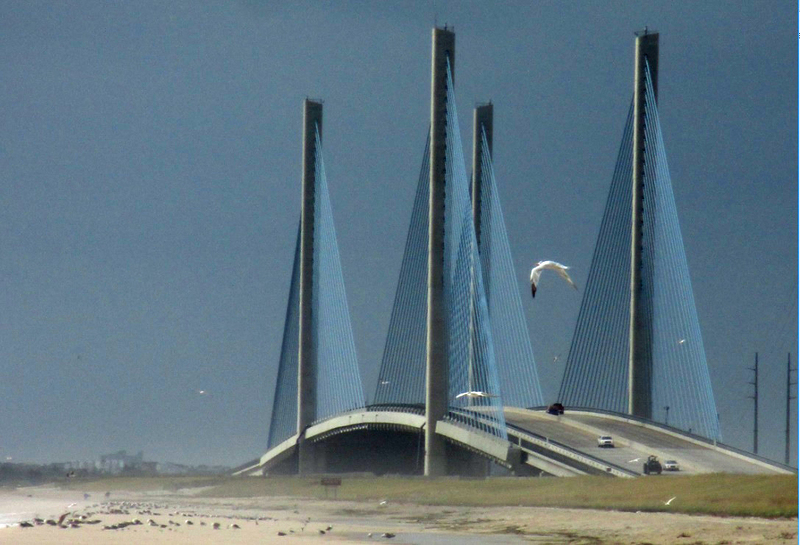 The distinctive blue color of the cables was chosen in a referendum by the people of Delaware. The bridge is wonderfully hiker friendly, with a wide pedestrian walkway with night lighting that is separated from traffic by a concrete barrier and guard rail. To me this bridge is more than a utilitarian structure. It is a work of art. South of the inlet there's another couple miles of State Park beach, followed by three miles of "private beach" with no public access and a continuous line of expensive homes, and then you come to Bethany Beach, with its 1/3 mile boardwalk. I passed there during the annual Bethany Triathlon and the downtown area was abuzz. The parking spaces along central Garfield Parkway were all filled with the 850 bicycles of the race participants. I got to see the swimmers emerging from the ocean--plenty of lifeguards and emergency personnel on hand. And if that was not enough excitement, there were a couple of whales spouting and breaching out beyond the surf. I tried, but didn't get any decent photos. Later I was passed by the first of the runners. The race route came right by our cottage in South Bethany. Beyond I passed WWII observation tower number one - the southernmost - with a bit different architecture. Then there is York Beach, another short stretch of public beach, which allows vehicle access and was packed with fisherman on a warm Saturday. Finally the trek ended at 146th Street in Ocean City, MD. There, right on the state line and inland a few blocks, is the Fenwick Island Lighthouse. On the way back, I caught a lone Great Blue Heron fishing in the sound. Well, that was a pretty long report. Thanks for persisting to read this far. Below is a map of the route, with push-pins marking many more photos.